Dr. John “Jack” Alexander Ruttle was born in Tupperville, Ontario on May 17th, 1907. His parents were William Henry Ruttle and the former Mary Ann Wickens. At the time of his birth his father’s occupation was listed as a storekeeper, but the 1921 census indicated that he was a farmer. Dr. Ruttle had 2 older brothers, Harold and Joseph and a younger sister named Madeline Elizabeth. He attended S.S. #9 in Chatham Township and Chatham Collegiate Institute. 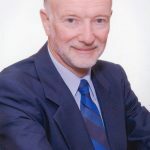 Dr. Ruttle continued his education at the University of Western Ontario where he obtained his B.A. in Honour Sciences in 1930. While at the University of Western Ontario, Dr. Ruttle played on the Junior Varsity Football team, as a linesman. He completed his M.D. in 1933 also at the University of Western Ontario. He interned at St. Mary’s Hospital in Detroit, Michigan. In a letter Dr. Ruttle wrote to the University of Western Ontario Alumni Gazette in 1978, he stated that he was paid, “$5.00 per month plus bed and meals”, while he was interning in Detroit. After completing his internship, Dr. Ruttle returned to his roots and started a family practice in Dresden in 1934. Dr. Ruttle married Rhoda Alexandra Anderson on the 17th of April, 1937 in Beamsville, Ontario. Mrs. Ruttle was born in Hamilton, on the 20th of February 1908, the daughter of James Alexander Anderson and the former Rhoda Sophia Draper. By the time she was 3 years old, she was living in Regina Saskatchewan. She had a younger brother named James, who was born in Saskatchewan. According to the 1916 and 1921 census’, Mrs. Ruttle and her family were living in Moose Jaw, Saskatchewan. Mrs. Ruttle attended the University of Toronto and became a high school teacher in Dresden. Dr. and Mrs. Ruttle met in 1934. They had 3 children; James William, Carol E. (Ruttle) Stephen and R. Andrea (Ruttle) McElhone. Dr. Ruttle served on the Dresden Public School Board. 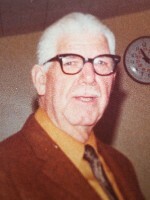 He was a member and past president of the Dresden Kinsmen Club and the Dresden United Church. Dr. Ruttle was a recipient of the prestigious Glenn Sawyer Award for his service to medicine and to his community. 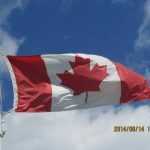 He enjoyed fishing, boating, curling, baseball and lawn bowling. On the 20th of November, 1974 the community of Dresden held a night of appreciation celebrating the 40 years of service, Dr. Ruttle had provided to the citizens of Dresden. Dr. Ruttle died on June 4th, 1979 in Chatham. 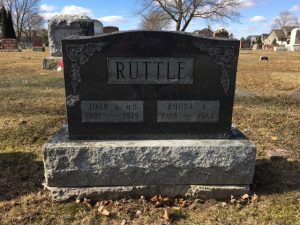 Mrs. Ruttle died on the 25th of February 1984 also in Chatham. They are buried at the Dresden Cemetery, near Dr. Ruttle’s parents.